Ancient Greek Inventions are in fact the original concepts of some of our most well known products, to this day. Those original concepts have just taken on a more modern form. The early days of the Greek civilization gave birth to many admirable scientists, and they in turn have managed to pave the way for further discoveries by the following generations. If your curiosity has been peeked and you are wondering exactly what the ancient Greeks contributed to our modern century, other than the well known concepts of democracy and trial by jury, the following is a just a small sample of what they had to offer. The first alarm clock was conceptualized in ancient Greece. It was thought up by Ctesibus, a Hellenistic engineer and inventor. During those days, time was usually indicated using a water clock. Ctesibus then used an elaborate system comprised of dropping pebbles on to a gong to make a sound. This sound was set to happen at specific time intervals, giving rise to a rather crude yet effective version of the modern alarm clock. 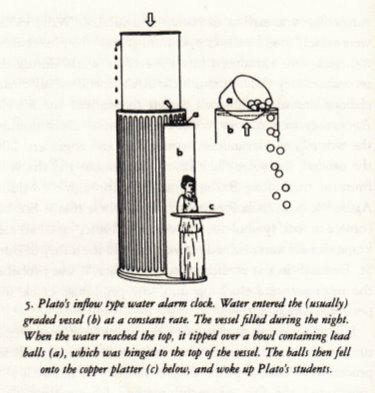 Plato himself is also credited with creating a version of an alarm clock that combined water filling up a vessel and making pebbles drop to make a sound. Odometers are measuring tools that help quantify distance. They were originally used to figure out how much distance has already been travelled by a vehicle. 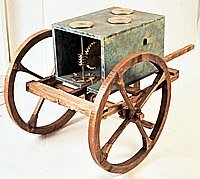 Although there is still a dispute around the original Greek inventor of the odometer (some say it’s Hero of Alexandria while others point out to Archimedes), there’s no doubt that the invention of the odometer has helped the ancient Greek civilization. It helped the Greeks to create roads and bridges for travelling, set milestones at specific distances, and helped develop their empire, boosting their economic standing. Where would we be without central heating? imagine hard cold winters, and nothing to help you get warm. In ancient Greece, the Temple of Ephesus was kept heated through flues planted on the floor. The flues circulated the warm air generated through a fire, providing a comfortable temperature throughout. The concept was mostly forgotten by the following generations but was rediscovered during the Industrial Revolution and continuously developed until it reached the product we are familiar with these days. The thermometer is constantly being used for a wide array of needs these days, from health care to chemistry. The original technology behind it is quite old, dating back almost 2,000 years ago. It was the Greeks of Alexandria that first figured out how air expands when exposed to high temperatures. It was Philo of Byzantium who first applied this technique to determine the temperature and the concept was later on improved by Galileo. It was Galileo who introduced the concept of a “scale” to quantify the process but his work was based on the original invention of the ancient Greeks. It seems logical nowadays to always have a map leading you from one spot to another but in the old days, the concept wasn't as prevalent. Before the ancient Greeks introduced maps, guides were vague, prone to mistakes and misinterpretations, and mostly written by sailors in a descriptive manner. It was the Greek Anaximander who conceptualized the idea of longitude and latitude to standardize land plotting. Other Greeks like Strabo and Eratosthenes further created maps spanning the world. The crane was an important tool that is still being used today for construction purposes. Unlike the original Greek design, however, the modern crane is sturdier and capable of carrying heavier weight. The original concept the ancient Greeks came up with, didn’t change—an elongated item was attached to ropes that help hoist up heavy objects for building. In ancient Greece, the cranes were usually powered by donkeys and other animals capable of carrying burdens as well as the use of individuals of great strength. Levers are simple designs that had a huge impact on various industries especially in construction. It’s no wonder the Greeks were the first ones to make use of the idea. Levers use a pulley system to lift up heavy objects using a minimum amount of force. The item was first described by the Greek mathematician Archimedes during the 260 BC. It was already in use even before that time, but the Greeks are attributed with introducing the use of levers into ‘mainstream use’. There’s no question that many of the inventions attributed to the ancient Greeks had something to do with buildings and constructions. The wheelbarrow, a one-wheel transportation equipment that can be held and pushed by users to carry relatively light loads, is also attributed to the ancient Greeks. It is mentioned in an inventory from the building of the temple of Eluisis as a ‘one wheeler’. Many researchers believe a product of similar likeness was probably used in farming even before the Greeks times, but no evidence to the matter has survived to prove so. Believe it or not, the ancient Greeks had a significant part in the development of cannons, or at least the concept behind them, for use at war. The old Greek cannons operated through compressed air, launching projectiles to a target. It is believed that the cannon was conceptualized by Ctesibius of Alexandria. He was a doctor and an inventor, and many consider him the first published scientist in the area of pneumatics (the science of compressed air).